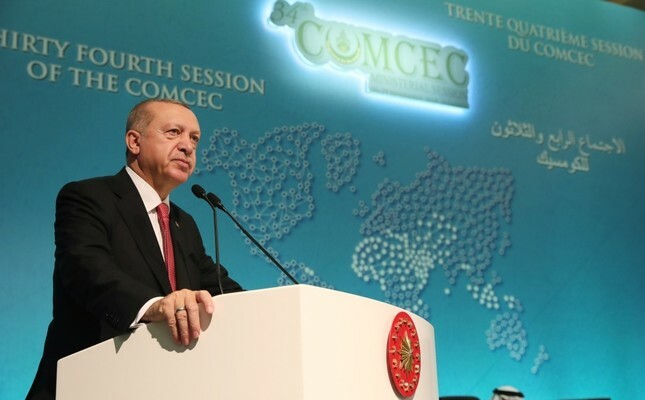 President Recep Tayyip Erdo?an speaks at the 34th meeting of the Standing Committee for Economic and Commercial Cooperation of the Organization of Islamic Cooperation (COMCEC) Ministerial Session in Istanbul, yesterday. Amid worsening concerns over international trade and the international monetary system, which is dominated by a single currency, Turkey has reiterated its call on Organization of Islamic Cooperation (OIC) countries to use national currencies in bilateral trade. Using local currencies with trade partners has been on Turkey’s agenda for some time now and it has taken some concrete steps to that end. President Recep Tayyip Erdo?an on many occasions voiced his support for the use of local currencies as the medium of exchange in bilateral trade with top trade partners, in order to alleviate foreign currency pressure. In his address at the 34th meeting of the Standing Committee for Economic and Commercial Cooperation of the OIC (COMCEC) Ministerial Session in Istanbul yesterday, Erdo?an once again called on members to trade in national currencies. Using national currencies among Islamic countries is an important step toward breaking imperialist shackles, Erdo?an said. Boosting trade among the COMCEC member countries would make them stronger, he added. On previous occasions, the president had alarmed Islamic countries to resist global crises and pressures, pointing out that the importance of taking steps to remove the pressure of international exchange rates. He stressed a participatory finance approach and a gold-indexed step in currency would be the right move. Furthermore, in his speech yesterday, Erdo?an also emphasized that the Islamic countries should use the platforms and tools in the best way possible to solve their own problems. “The more we invest in each other as COMCEC member countries, the higher we increase our trade, the stronger we will get. I would like to once again underline the importance we attach to increasing the trade within the OIC to 25 percent. I invite Islamic countries to complete procedures and update the concessions lists to make a preferential trade system a reality,” Erdo?an noted. “There is no other way out than to use our local and national money,” he stressed. Erdo?an also urged all member countries to participate in the activities of the Islamic Development Bank and its sub-institutions to facilitate trade. “As you know, the increase of tariffs by the current U.S. administration has increased protectionist tendencies in world trade. It is obvious that trade wars will cause serious damages to global trade, production and prosperity. Reducing non-tariff barriers and facilitating customs procedures will provide a new opening and will be a life buoy for the world trade,” the president continued. Addressing the gathering yesterday, Yousef al-Othaimeen, secretary-general of the OIC, said operations to finance trade are continuing to rise and investments in OIC member countries are concentrating on the trade and finance sectors. “Member countries are taking an interest in developing infrastructure and regional cooperation,” he noted. He added that several OIC member countries are focusing on trade, logistics and developing infrastructure. “The main goal is to encourage integration in the OIC and provide sustainable development in the goods and services sector,” he underscored. Within the framework of the event, a series of special events will be held today to address the many aspects of customs risk management under the concept of facilitating trade. High-level representatives from the public and private sectors, top officials of international organizations and academics will also be present as speakers during these special panels. In his address yesterday, Erdo?an noted that the member countries need to modernize their customs infrastructures, use information technologies more extensively and further simplify customs procedures. “I find it very meaningful and accurate that the issue of facilitating trade and customs risk management in the OIC member countries are being addressed during this year’s COMCEC exchange of views session,” the president added. The president also emphasized that the member countries need to accelerate the work so that the initiatives such as preferential trading system, gold exchange, real estate exchange and Istanbul Arbitration Center can be put into practice as soon as possible. Meanwhile, important projects are being carried out under COMCEC, while work is also underway to establish an “OIC Arbitration Center” proposed by President Erdo?an during the 13th Islamic Summit. This center will be run under the auspicious of the Union of Chambers and Commodity Exchanges of Turkey (TOBB) in cooperation with the Islamic Chamber of Commerce, Industry and Agriculture (ICCIA) and will serve as a platform where both commercial and investment-related disputes among the OIC member countries can be resolved. The project on the establishment of the center has reached its final stage. Also, the works on the establishment of the COMCEC Gold Stock Exchange and the Real Estate Securities Exchange continue. The two projects, which will offer alternative investment opportunities to Islamic countries, will contribute to the deepening of the financial cooperation among them. The Trade Preferential System among the Member States of the OIC (TPS-OIC), which is considered to be COMCEC’s most important project for increasing trade among the Islamic countries, has also reached its final stage. The system will become operational with three member-countries forwarding the current concession lists. With 57 members and five observers, COMCEC stands out as the international organization with the highest number of members after the United Nations. Serving as the main decision-making body at the ministerial level and seeking solutions to the development issues of Islamic countries, the platform has been meeting at the ministerial level annually since 1984 and realizing many important projects and programs to develop economic and commercial cooperation among member countries.